Announced in June 1982. 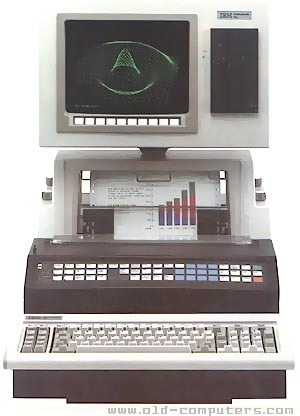 Based on the Motorola 68000 CPU, this personal workstation was intended for interfacing with laboratory instruments to acquire and analyze experimental data. In addition to a regular PC keyboard, it had a touch panel for controlling experiments. It had a custom realtime multitasking operating system called CSOS, and could be programmed in Pascal, Fortran, or Basic. The 128KB memory could be expanded up to 5MB. Up to 4 10MB hard disks could be installed, as well as various combinations of 5.25- and 8-inch floppy disks. The screen had 80 columns × 30 rows in text mode and 768 × 480 pixels in monochrome graphics mode. I/O interfaces included serial, parallel, IEEE-488, and analog, with an integrated color printer — a big package in a small footprint. I attended a nondisclosure presentation of this product by IBM in 1980 or '81 and recall commenting that if they stripped away the instrument control panel and interfaces, they'd have a desktop computer that was miles ahead of anything else on the market. Wrong division, I guess.